Our brain is one of the most vital organs in our body and one of the least-understood. In our society, more and more people have problems with their brain, and many problems come with the aging process. There are mental problems, which increasingly are associated with malfunctioning of the brain. Depending upon the source, experts say as much as 10 percent or more of our population does not have sound, healthy brains. Is there any remedy? Is there a way to reduce this problem of the brain? Can qi improve your brain? Can qi help you to slow down this part of the aging process? Can qi help you retain your memory? Many practitioners in Chinese medicine believe qi can indeed do all of these, and more. 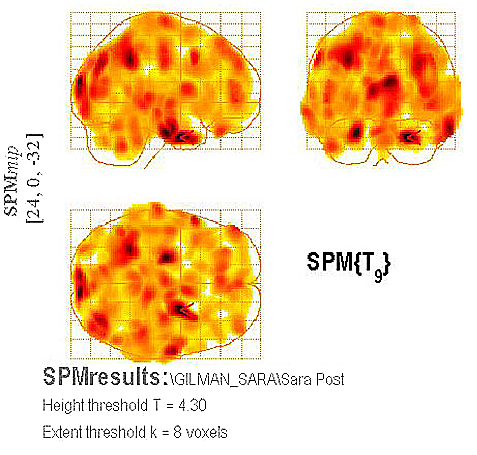 Subject 1 post-treatment SPECT image (D.Amen) showing a distinct increase in activity. In the above electroencephalogram, the second EEG image was far more even than the first EEG image, reflecting a healthier brain state. But is there any scientific evidence based on qi's positive effect on the brain? Let us look at the evidence of both internal qi and external qi. Acupuncture changes the internal qi circulating around the meridians in the body. There are many scientific experiments that show acupuncture at acupoints of the body that do affect the brain. The most notable of these experiments is from acupuncture anesthesia where insertion of needles at various acupoints of the body causes the secretion of endorphin in the brain. One of the most recent experiments involving internal qi was done with functional MRI. Upon inserting a needle on the acupoints GB-38 in Gallbladder meridian on the leg, one finds measurable effects in the vision center in the brain. Now what is the effect of external qi on the brain? From a purely scientific point of view, the effect of external qi emitted by a qigong practitioner on the brain is harder to recognize, but once shown, it is easier to see that it's due to qi and not to other physiological phenomena within the patient's body. Here are some preliminary results of a study I conducted several months ago with three professors of medicine at UC Irvine, including Dr. James Fallon, professor of anatomy and neurobiology and director of neuroscience; Dr. Daniel Amen, a best-selling author, psychiatrist and the medical director of Amen Clinics, Inc.; and Dr. Yi Jin, an assistant clinical professor of psychiatry and human behavior and director of the behavioral EEG laboratory. The study reported the effect of external qi on the brain measured by three kinds of precision instruments: infrared camera, EEG (electroencephalogram), and SPECT (single-photon emission computed tomography), which scans the activities of the brain. This study involved seven volunteers with varying degrees of attention deficit hyperactivity disorder (ADHD), which is regarded as being due to a malfunction of the brain. Dr. Tatsuo Hirano, the qigong master, emitted external qi one meter from the back of the patient, in order to nullify influences from any wishful thinking or placebo effect. Only the researchers, not the subjects, were kept abreast as to when the treatment truly was being provided. An infrared camera was used to map the distribution of the subject's skin surface temperatures before and after each treatment. 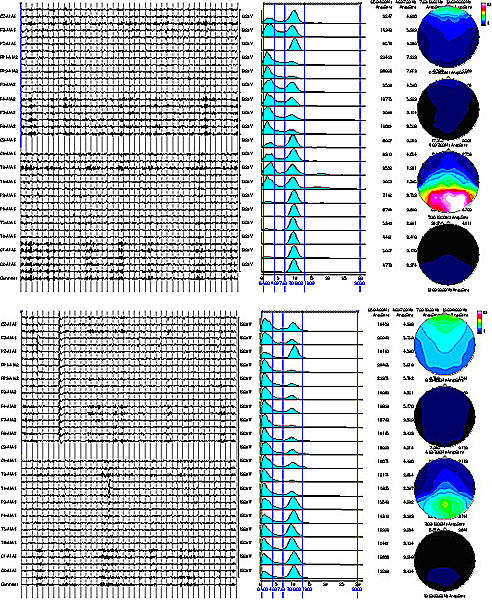 EEG readings were used to monitor and record changes in activity of the subjects' brain waves before, during and after the treatments. SPECT scans were taken prior to, and then 24 hours after the treatments, in order to capture detailed anatomical and physiological profiles of the subjects' brains. The resulting diagnostic measurements, regarded as indicators of various bodily functions, were tabulated, compared and interpreted by the respective experts with the collaboration of Dr. Chris Hanks, director of research and information systems at Amen Clinics, Inc. All the experts agree that the results are consistent and show changes, sometimes quite dramatic, in all seven subjects studied by external qi. 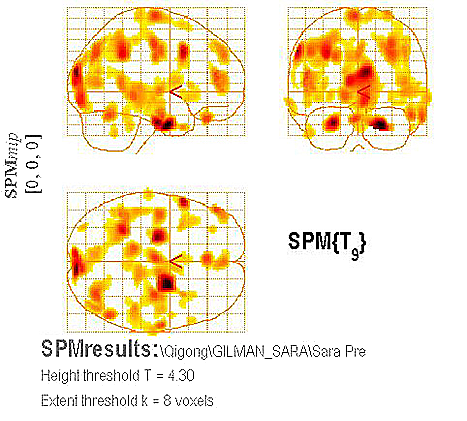 Pictures from SPECT and EEG are direct evidence of brain changes from external qi. Infrared camera pictures of the face are indirect evidence for some change in the brain because according to the meridian theory of Chinese medicine, the internal structure of organs is reflected via meridians to the surface of the body. From a practical point of view, can one improve his/her brain with qi? It is difficult to get a qigong master to pump qi to your brain day after day. And it's painful to have needles inserted into your body. The best way to improve your brain is through the practice of qigong. There are many claims that certain qigong exercises improve brain function. We do not have sufficient scientific evidence, yet. But, I believe that qigong improves the brain. We wait in hope and continue to practice in the belief that they will come one day. Editor's Comments: This entry, with the approval of its author, was taken from Acupuncture Today, March, 2007, Vol. 08, Issue 03. Slight changes were made to fit the stylistic requirements of Qi Encyclopedia. ^ Magnetic resonance imaging (MRI) is a medical imaging technique used in radiology to image the anatomy and the physiological processes of the body in both health and disease. MRI scanners use strong magnetic fields, radio waves, and field gradients to form images of the body. Wikipedia. "How Does Acupuncture Work?" Acupuncture Wellness Solutions.